The mere thought of fleas in your furniture is enough to make any of us start to itch. Unfortunately, fleas are resilient and well adapted at staying hidden during most of their life cycle. Your couch, carpet and even your bed could be harboring these irritating pests. If you want to beat them, you must attack them wherever they could be lurking. Luckily, an easy way to eradicate fleas from your furnishings is by using a flea spray for furniture. These formulas are specially designed for use indoors. They can be extremely effective at eliminating fleas when used correctly. Flea sprays are available in a variety of formulas, and can often destroy a flea infestation within a couple of weeks. We will discuss how these products work, some of the best options, and how to use them to get rid of fleas in your furniture. Fleas are a real nuisance. They are famous for being difficult to get rid of and they multiply rapidly. If you wish to understand how flea sprays can help you to eliminate these pests, you must first familiarize yourself with the life cycle of a flea. Fleas are divided into hundreds of different species. All species are categorized under the taxonomic order Siphonaptera. Of these many species, it is Ctenocephalides Felix, or the cat flea which is most common throughout the households of the US. Despite its name, this species will feed upon dogs, humans and other mammals, not just cats. The life cycle of a flea consists of four separate stages: egg, larvae, pupae, and adult. The development timescale across all four stages can vary dramatically from a few weeks to many months. Fleas are able to suspend animation and remain in a pre-adult state for quite some time. This happens if the surrounding environmental conditions are not suitable. Adult fleas are anatomically and biologically designed to remain upon their host for the duration of their lives. They must feed regularly upon the blood of the host in order to maintain fertility. Female fleas are capable of laying as many as 50 eggs in one day. This equates to around 500 to 600 eggs over their lifespan. Flea eggs are sticky at the moment they are initially laid​​​​. They quickly dry out and lose this adhesive property, falling from the fur of their host and dropping to the ground. The host animal acts as a distribution vehicle for the eggs, leaving them wherever it may roam. These eggs will most often settle among carpet fibers and within the cracks in wooden floors. They can also tumble down in between cushions and into the textiles of furniture. The eggs will hatch into flea larvae, usually within a week or so. These larvae eat flea feces and their own skin sheddings for the next one to three weeks before transitioning into the pupal stage. The larvae will spin a cocoon, attaching themselves to textile fibers if they can. This pupal stage is the final stage before becoming an adult flea. Adults can emerge from the pupal stage in as little as five days, or remain there for more than 12 months. Emergence depends on the humidity, temperature, and signals that there is a host to feed upon in the area. Once they have emerged, the adult fleas will climb up to the surface of their hiding place and leap onto the first warm-blooded creature that passes. Fleas in all stages of the life cycle are found lurking among the creases and dark, hidden spaces of your furniture. Hence, flea sprays are incredibly useful in targeting these areas effectively. There are two kinds of flea spray: pesticidal and non-pesticidal. Pesticidal sprays most commonly use a chemical called permethrin in their formulations. This chemical is known as an adulticide, meaning it effectively kills pests in their adult stage. Permethrin disrupts the nervous system of fleas, causing paralysis and rapid death. Permethrin is derived from chrysanthemum plants. Adulticides are great for wiping out the adult population of fleas and halting the immediate breeding process. This helps to buy some time, but does not solve the ​flea infestation issue completely. Any home which has had fleas will undoubtedly have fleas in other life cycle stages hidden throughout the home. This is essentially a time bomb waiting to go off, once eggs, larvae and pupae develop into adults. For this reason, adulticides are commonly used in combination with insect growth regulators. A popular insect growth regulator is pyriproxyfen. These pesticides interfere with the flea life cycle. They cause flea eggs to become unviable and prevent other pre-adult stages from reaching maturity. The other kind of flea sprays are those which use natural extracts, such as essential oils instead of pesticides. Some essential oils can kill fleas if they come into direct contact with the substance. However, the majority of oils will simply repel fleas, not kill them. This type of repellent effect can indirectly kill fleas by denying them access to a host to feed upon. Strong-smelling essential oils like lemongrass or eucalyptus are very irritating to fleas. Once applied, fleas will rapidly vacate the area and will not return as long as the smell remains. With so many flea sprays on the market, it can seem impossible to know which one to choose. Below, we discuss our three favorite flea sprays for furniture. Wondercide is a very popular company, which focuses upon natural, chemical-free treatments for home and pets. Their flea control sprays come in a variety of essential oil formulations, including lemongrass, rosemary, cedar, and peppermint. These ingredients are known to effectively repel fleas. Cedar oil, in particular, has the potential to kill fleas when it comes into contact with their bodies. Wondercide claims that cedar oil achieves this by blocking a chemical which is responsible for the regulation of a flea’s heart rate and metabolism. This spray can be safely used on furniture, as well as directly upon your pets. In the case of cats, which are more sensitive to chemicals and essential oils, Wondercide suggests using their 4-oz bottle. Spray it into your hands before applying to your cat. If you have any pregnant animals in the home, you should avoid the peppermint oil formulation. The variety of scents is a benefit of this product. As you will be spraying across your furniture, it is helpful to be able to choose a scent which you will find pleasant. This is a pesticidal spray, containing permethrin and the insect growth regulator, pyriproxyfen. This combination of an adulticide and an insect growth regulator ensures highly effective treatment. Adult fleas will be killed immediately by permethrin, while the development of the remaining life cycle stages will be halted. This spray contains enough solution to treat an area around 2000 square feet. It can be sprayed on carpets, rugs, upholstery and drapes. It is advised to test the spray on a small, inconspicuous patch of fabric before proceeding. This product claims to be able to prevent re-infestations for as long as seven months after treatment. In severe infestations, this treatment should be combined with regular vacuuming and be reapplied around two weeks after the initial application. This is because some pupae may still hatch as they are usually very deep and well-sheltered among textiles. Siphotrol Plus II is another pesticidal flea spray. The adulticide permethrin is used, plus an insect growth regulator called methoprene. Methoprene has the same function as pyriproxyfen. It also remains active for many months after the first application. Adult fleas are killed within 10 minutes of application. It claims to have a 100% knockout rate of adult fleas when applied correctly. Thus, this spray will quickly eradicate the active breeding population as well as stopping further adults from developing. The formulation is lightweight, water-based and non-greasy. It is able to absorb well into furnishings, where eggs, larvae and pupae will be hiding. It leaves no sticky marks on the upholstery, and the scent dissipates quickly. When using flea sprays, it is important to be aware that it is against Federal Law to use pesticides in a manner inconsistent with their labeling. All products will be accompanied by detailed instructions, which should be followed closely. I will provide some useful general advice regarding how to best use flea sprays. However if this is in conflict with your product directions, you should always apply as directed by the spray manufacturer. With this in mind, the best place to start is by identifying key areas in your home which will need to be treated. Carpets are one of the most important areas to focus upon. Flea eggs, larvae and pupae will develop deep at the base of the fibers. If you don’t have carpets, any cracks in wooden or stone floors must be treated. Failure to treat these areas will certainly result in a re-emergence of fleas within a few weeks. 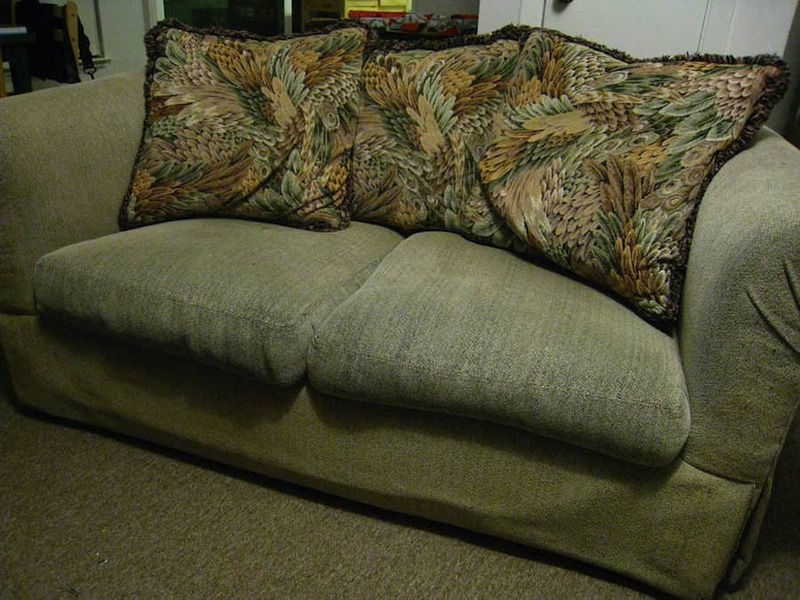 With regard to upholstery, it is recommended to test your flea spray on a small patch of fabric before treatment. While these sprays are designed for use on furniture, they may cause a reaction in rare cases. Fleas, at all stages of their life cycle, can find their way into the fabric of couches and cushions. Often overlooked are the undersides of large soft furnishings, which should also be treated. Before spraying, remove all food utensils, cover food preparation surfaces, remove pet food, toys, and water bowls, and cover aquariums. If you have children, ensure any toys are removed from the area. Make sure to keep pets and children out of the room. Vacuuming the area thoroughly before spraying will further boost effectiveness. This is because it will remove any dust and debris which could hinder the absorption of the solution. A standard 16-ounce spray can usually treat about 2000 square feet. Hold the product about three feet from the surface of your carpet and furniture, and apply in a smooth sweeping motion. You must try and apply a light but uniform coverage across all the treated surfaces. You do not want to make any surface wet. Instead, aim to lightly dampen target areas. When finished, vacate the room, keep it ventilated and allow the product to dry completely before returning. Even though flea sprays are effective, you should maintain realistic expectations about the results. Fleas are notoriously difficult to eliminate. Insect growth regulators may not affect all the eggs, larvae and pupae in the home the first time around. For this reason, many products advise a further application after a couple of weeks. There are some hazards to be aware of when using flea sprays. Exposure via the skin, eyes, and inhalation is best avoided. After using a flea spray, you should wash your hands to avoid ingesting the solution. Always follow the directions provided carefully. There are some health effects that can occur from exposure to permethrin. If dogs or cats get permethrin on their skin, they may behave unusually. Twitching, rolling and flicking their paws are common signs. If they have ingested the chemical, they may begin to smack their mouths and drool. Cats are especially sensitive to the effects of permethrin. They are not able to metabolize chemicals well, due to the absence of an enzyme in their liver. Cats will appear stressed and have trouble walking. In serious cases, they can have seizures and can die as a result. If people get permethrin onto their skin, it can cause irritation and a burning sensation. If it gets into the eyes, it will cause pain, redness and blurred vision. It should be rinsed immediately and the sufferer should consult a doctor. Inhalation of permethrin can result in coughing, vomiting, headaches and dizziness. There is uncertainty surrounding whether or not permethrin causes cancer. The International Agency for Research on Cancer (IARC) describes permethrin as not classifiable as to its carcinogenicity to humans. The Environment Protection Agency (EPA) believes that permethrin is likely to be carcinogenic to humans if consumed. Always keep pesticides well out of the reach of children and animals. It is imperative that you keep treated areas secure and well ventilated. Only return to a treated area once the solution has completely dried. This ensures neither yourself nor your pets will get pesticide on the skin. Those who use natural flea sprays must also take precautions. Just because a product is made up of natural ingredients, this doesn’t mean there are no risks involved in its use. Essential oils are generally safe for humans, although they can cause irritation if they come into contact with skin. However, essential oils should never be ingested. The main consideration when using essential oils is exposure to pets. Ingredients which are safe and non-toxic for humans can be poisonous to your pet. As previously mentioned, cats are particularly sensitive to toxins. This includes compounds in essential oils. Therefore, take care when choosing, and using, natural flea sprays. If you feel concerned or unsure about which product to use, speak to your vet for the latest advice. If your pet has been poisoned, they will display symptoms such as: vomiting, drooling, tremors, difficulty breathing, wobbliness, anxiety and low heart rate. In some cases, your pet may simply become quiet and act strangely. If for any reason you believe your pet has consumed poison, you should call your vet or the 24/7 Animal Poison Control Center for help and advice immediately (855) 764-7661. Acting quickly increases the chances of saving your pet. As long as you are sensible and follow the directions of your chosen flea spray, you should not encounter any problems. Home furniture can be an easy hiding place for fleas. These blood-sucking pests will develop deep within the fibers, causing a nasty surprise when they emerge. Since fleas can multiply at an incredible pace, tackling an infestation could be difficult. The use of flea sprays for indoor furnishings is a great way to hit fleas where it hurts. Whether you choose pesticide options, or prefer a more natural approach, furniture sprays make beating fleas much easier. So long as flea spray for furniture is used responsibly, both you and your pets should be happy and flea-free in no time.